Beautifully ripe figs, with those splits in the skin showing they are perfectly ready to eat. This is my favourite time of year in my garden, because it’s fig season. We have an old fig tree we keep quite tightly pruned, since they can be simply enormous when left to their own devices. And every year it produces an absolute mass of big, purple fruit. The birds and the bats get their fair share, and the possums of course, but there is still plenty for us. Every morning for breakfast I raid the tree, see what the overnight predators have left behind. It doesn’t matter how many or how thoroughly we picked the day before, or how many possums we heard rummaging among the leaves, there are always more. It’s one of the things I love about it, that the figs look small and weeks off being ripe, and then suddenly, a day or two later, they’re ready to eat. It seems like magic. The wonderful pale blush colour of the fig ice-cream, with traces of the purple skin and darker pink flesh peeking through. There are many wonderful things to do with figs, apart from the simple joy of eating them, but my very favourite is fig ice-cream. 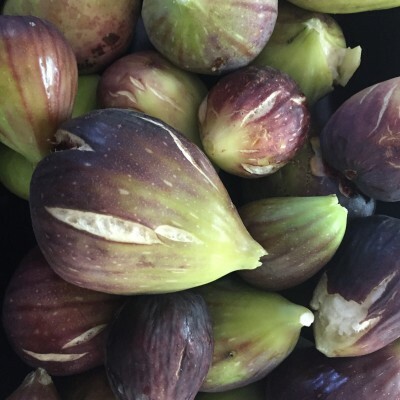 This recipe came from my friend Graham, who is a regular visitor in fig season and takes them away for his own wonderful creations. One wonderful day, he swapped me his old ice-cream maker for a bountiful container full. I’m still grateful. And with that maker he handed over this recipe. It is my favourite ice-cream. 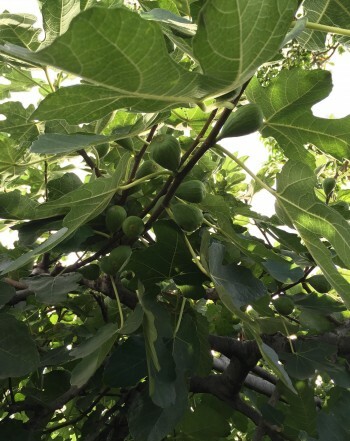 They look small and hard, but in a few days these figs will be huge and purple and delicious. Put these ingredients into a pot and keep at a slow boil for about 15 minutes. Add half a cup of sugar and cook until it reduces a little and looks glossy and jammy. It will need regular stirring at this stage. Let it cool and put it in the fridge for at least several hours. Then add a cup of thickened cream and mix well. Add a little lemon juice if desired. 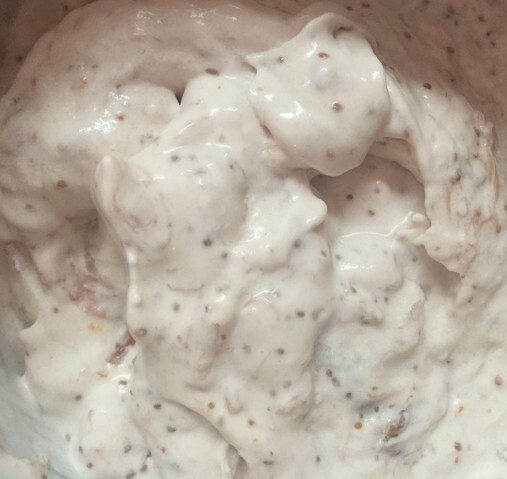 Put it in your well-chilled ice-cream maker and churn for about half an hour.